I decided to read papers outside on Saturday. I wanted to feel the sunshine on my limbs and face and revel in the warmth of a surprisingly summer-like October day. Plus, as I'm a couple weeks behind, I have accumulated a stack and I didn't have far to walk to toss the read papers into the recycling bin. I made some tea and went outside. Mija and Pilchard came outside too. Mija didn't stay for very long. If I moved, she would bolt back inside and, ultimately, decided she didn't want to be outside. Pilchard, on the other hand, decided that the outside was wonderful and she wanted to be out in it. 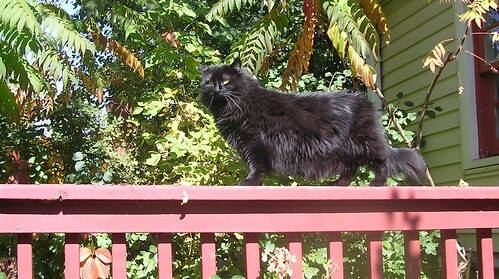 She had never, prior to yesterday, expressed any interest in getting on the deck railing. She's gone through the slats to get off the deck, but never seemed to be interested in jumping up. That has obviously changed. Pilchard had a ball yesterday. She walked around the north side and then walked around the south side. The south side took her up to the open window in the office which has a screen covering it. She sat down and meowed until I removed the screen and she could come in. She explored the deck floor and would look at the back yard, even going down the steps. But the minute I yelled, "Pilchard! Get back on the deck! ", she would turn around and come inside the house, sitting in the open doorway. 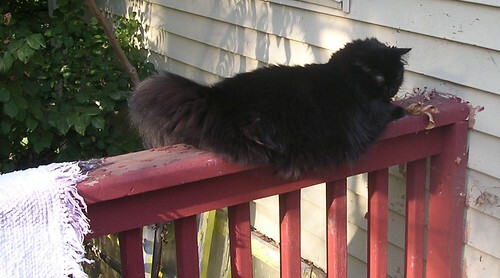 Eventually, she decided the best place to be was on the railing. She stayed there for over an hour, just watching the leaves fall off the trees and the birds fly overhead. I only had one time when I was worried. A squirrel came up onto the deck to drink water from my pseudo birdbath and Pilchard spotted it. She was on the first step of the deck before I could get to the back door. When told to come back on the deck, she turned and came back into the house. Today, they are both asleep in the living room. Perhaps all that fresh air from yesterday has them tired out. It's great to see them expand their world view while still remembering that they are indoor cats. I'm particularly thrilled with the coming when called. Who says cats can't be trained?